Guru Shakya Sengé (Skt. Śākyasiṃha, Tib. གུ་རུ་ཤཱཀྱ་སེང་གེ་, Wyl. gu ru shAkya seng ge; Eng. 'Lion of the Shakyas') — one of the Eight Manifestations of Guru Rinpoche. In this form, he is depicted as a buddha in monastic robes, holding an alms bowl in his left hand and a vajra in his right hand. At 'the Vajra Seat' in Bodhgaya, Guru Rinpoche displayed miracles, acknowledging he was a self-manifested buddha. 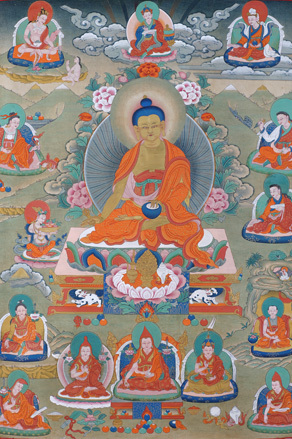 Although he was a fully enlightened buddha, he appeared as a nirmanakaya manifestation to tame and teach beings in this age, and so for their benefit he acted as if receiving teachings, accomplishing the practice and passing through the various stages of spiritual realization, one by one. Some accounts tell how in Vajrasana, he was ordained by the Buddha's closest disciple, Ananda. Others say he took ordination from Prabhahasti in Zahor and was given the name Shakya Sengé, 'Lion of the Shakyas'. This page was last edited on 5 February 2017, at 21:00.